In the final part of this tutorial series, I'll go over how to access the components in the swf menu files from within Unrealscript and how to switch between our three different menu screens. We'll handle the click events for the buttons and the option steppers and I'll show how to load a list of resolutions from a configuration file and populate the option screen's resolution option stepper with those values. We'll also write out the changes we make in the Options Menu to the same configuration file so that they're saved for the next time the game launches. There is a LOT of code to go over, so let's dive in. Much of the functionality of our three menu screens is common to all three screens (clicking a button switches to another menu screen, handling the mouse, etc. ), so we're going to start by creating a parent class for our menu screens - just like we did in Flash. Open up the Development\Src\Tutorial.sln and create a new Unrealscript file (Project -> Add New Item) called "SFMFrontEnd.uc". It should extend "GFxMoviePlayer" and be abstract (we won't actually ever create any instances of this class, just of its children classes). Think of the GFxMoviePlayer class as sort of an Unrealscript wrapper around a swf file. Since this is an abstract parent class, there won't actually be a swf file associated with it, but each of the child classes will define which swf to reference. Now create two global GFxObject variables: RootMC and CursorMC. The RootMC will reference the ActionScript "root" variable of the swf and the CursorMC will reference our MouseCursor varable "cursor" that we created in the SF_FrontEnd.as class that all our menu swfs inherit from. The "TimingMode" can be set to follow either real time or game time. Since the menus happen before the game even starts, we'll go ahead and use real time. We'll be adding a few functions to this class later, but for now, let's move on. A GFxWidgetBinding object has a name and a class. The name is the variable name within Flash and the class is just GFxCLIKWidget (or a custom child class that extends GFxCLIKWidget if you create one to add custom functionality). Again, there's a little bit more we need to do with this class, but I want to import the swf files into the Editor's Content Browser and set up the map and Kismet before we move on, so save the files, close down Visual Studio and open up the UDK Editor. When the editor has finished launching, open up the Content Browser and click the "Import" button. Browse to the UDKGame\Flash\ScaleformMenuGFx folder and select the "SF_Library.swf" file. Remember that the Content Browser automatically assigns a package and group according to the file structure, which is why we laid things out the way we did. Accept the default values and hit OK. 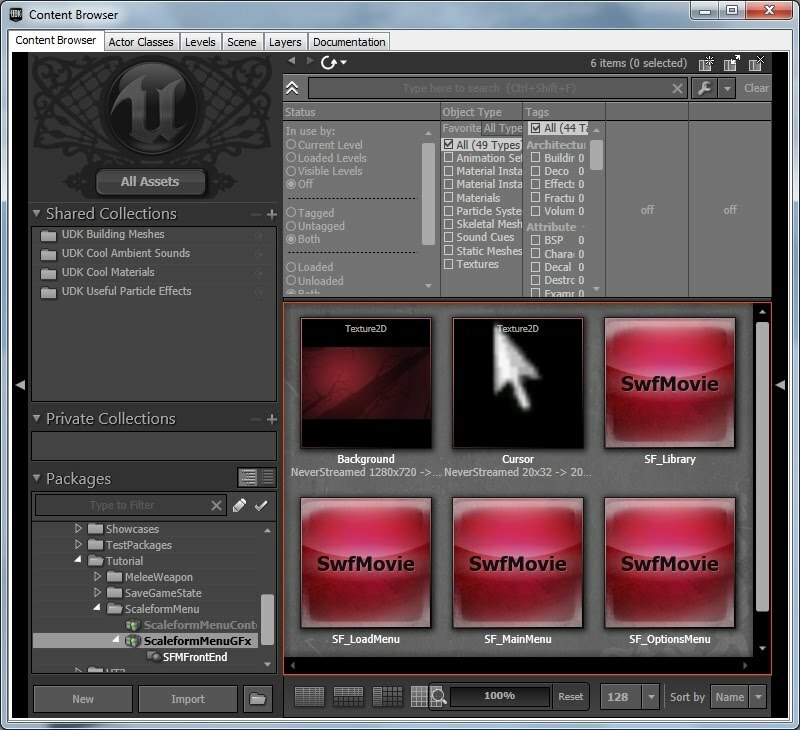 The swf asset, background image and cursor image assets will show up in a new package. Save this package in the "UDKGame\Content\Tutorial\ScaleformMenu" folder as ScaleformMenuGFx.upk. This will move the package out of the "NewPackages" folder into the "Tutorial\ScaleformMenu" folder. Next, import the SF_MainMenu.swf, SF_LoadMenu.swf and SF_OptionsMenu.swf files from the UDKGame\Flash\ScaleformMenuGFx\SFMFrontEnd folder. They will get organized into the SFMFrontEnd group inside the ScaleformMenuGFx package. When you're all done importing, you should have four swf assets and two image assets in the ScaleformMenuGFx package. Next, we need to create a map to house our front end. Create a new blank map and just build a cube right in the middle. Add a player start, do a quick "Build All" and save the map as "ScaleformMenuFrontEndMap.udk" in the "UDKGame\Content\Maps\Tutorial\ScaleformMenu" folder. This is the map you will actually launch when you start your game. If you're using nFringe, you'll want to set this map as the map to load at startup in the project properties. Next, open up the Kismet editor and place a new "Level Loaded" event and a new "Open GFx Movie" action (New Action -> GFx UI -> Open GFx Movie). 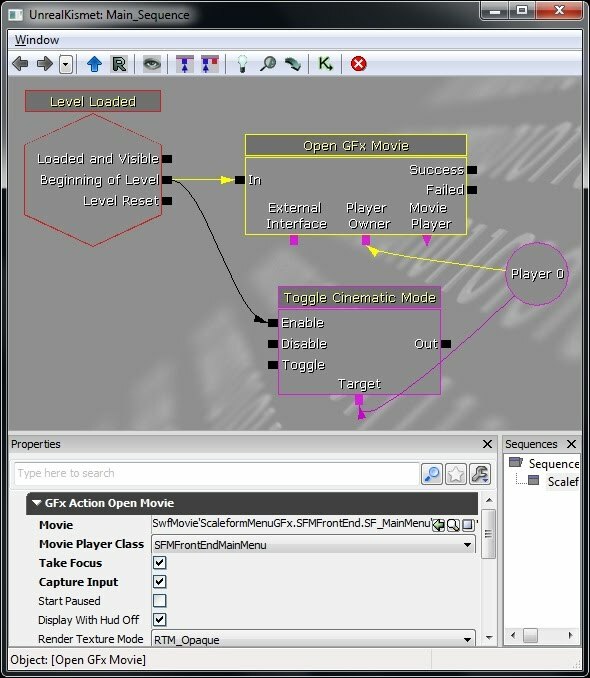 Connect the "Beginning of Level" output from the "Level Loaded" node to the "In" input of the "Open GFx Movie" node. Select the Open GFx Movie node and under the "GFx Action Open Movie" section, set the "Movie Player Class" dropdown box to "SFMFrontEndMainMenu". Check the "Take Focus" and "Capture Input" options (might be redundant since we assigned the bCaptureInput variable in Unrealscript, but better to be safe :)). Open up the Content Browser, select the SF_MainMenu swf asset, switch back to the Kismet editor and click the green arrow to assign the asset to the "Movie" field. Next, create a new "Toggle Cinematic Mode" action (New Action -> Toggle -> Toggle Cinematic Mode) and connect the "Beginning of Level" output from the "Level Loaded" node to its "Enable" input. Finally, create a new "Player" variable (New Variable -> Player -> Player) and uncheck its "All Players" option under the "Seq Var Player" section to get just Player 0. Wire the "Player 0" variable up to the "Player Owner" input from the "Open GFx Movie" node and the "Target" input from the "Toggle Cinematic Mode" node and save the map. Launch the map to make sure everything is working, but clicking the buttons won't do anything just yet. For that, we need to go back to Unrealscript, so close the editor and open up the Tutorial.sln solution again. We first check to see that it was the left button that was clicked and not any other. Note that in the May 2012 version of the UDK, the EventData isn't yet being set up correctly, so the "mouseIndex" will always be "0" no matter which button you press, but we'll insert this code for when it does work. All we do now is "Close()" this movie down and use the GFxMoviePlayer "ConsoleCommand" function to open up our first map - in this case, the "ScaleformMenuMap". This time, we do the same as before, but call the "exit" console command. Now add an event listener to the "ExitGameBtn" for the "ExitGame" function in the switch statement case for the "exitGameBtn" widget. Finally, we'll create two more functions for the "LoadGameBtn" and the "OptionsBtn", but we won't actually write anything inside them just yet. Name them "LoadGame" and "Options" and add event listeners for them in the WidgetInitialized function's switch statement cases respectively. We'll assign the "NextMenu" variable to an instance of the class we pass in (which will be one of the child classes of SFMFrontEnd - aka, a GFxMoviePlayer object), set the LocalPlayerOwnerIndex to attach it to our player, and call the Start() function to initialize everything. Finally, we close down the current menu item with a parameter of "false" to keep it loaded in memory in case we want to come back to this screen. In order to switch between menu screens, we need to create another one (since all we have right now is our Main Menu), so create a new Unrealscript class called "SFMFrontEndLoadMenu.uc". Do the same for the SFMFrontEndLoadMenu class, pointing it to 'ScaleformMenuGFx.SFMFrontEnd.SF_LoadMenu'. Now launch the ScaleformMenuFrontEndMap and you should be able to click the "Load Game" button to launch the Load Menu screen and the "Back" button to switch back to the Main Menu screen. Also, if you haven't yet, test out the "New Game" and "Exit Game" buttons as well. Whether the player cancels or saves from the Options Menu screen, we want to take them back to the Main Menu screen, so we'll call "LoadNextMenu" from both functions. Later, we'll add much more to the SaveOptions function though. Notice also that we're not adding any listeners to the Option Stepper widgets. Clicking the arrows on these widgets only cycles through their data provider arrays, and that's all taken care of in the ActionScript OptionStepper class, so we don't have to do anything but assign their data providers. We already set up the anti aliasing data provider in ActionScript, and we'll get to the resolution data provider a little later. Go back and add a call to "LoadNextMenu" to the SFMFrontEndMainMenu's Options function to load the SFMFrontEndOptionsMenu class to finish off the SFMFrontEndMainMenu class. If you test the game now, you should be able to navigate to all three menu screens. Now when you load the next menu screen, you might notice a little flicker as the mouse cursor moves back to where it was, but at least now it does go back. If it bothers you, you could experiment with trying to hide the cursor and show it again when the mouse moves, but you'd probably have to do at least some of that in ActionScript. Now, let's get back to reading our saved game file names and setting our game slot button labels. The GetString accessor function takes in the name of the variable you want to access and is available to any GFxObject variable. Now launch the game and click the "New Game" button on the Main Menu screen to start a new game. Open up the console and type "SaveGame 1\Test" to save a file called "Test.sav" in the "UDK\Saves\ScaleformMenu\1" folder. Exit the game and launch it again, this time clicking on the "Load Game" button. You should see the label "Test" on the first button, and if you click it, it will load the game you just saved. The other two buttons will get their labels from the first *.sav file they find in the "UDK\Saves\ScaleformMenu\2" and "UDK\Saves\ScaleformMenu\3" folders respectively. When the "Save" button gets clicked, we get the currently selected index for both option steppers and if either has changed, we run a ConsoleCommand to change the appropriate setting. For more information on these and other settings and how to change them, see the System Settings Console Commands and the System Settings pages. If either of the selected indices change, we save the new index to the config file with the SaveConfig command, which saves the current values of all variables marked with the "config" keyword. The resolution and anti aliasing settings get saved in the UDKEngine.ini file automatically because of the console commands we called, so we only need to save the variables for the SFMFrontEndOptionsMenu class. That was tons of code, but we're finally done! You can build on these screens by adding more options like a volume slider or a dynamic shadows checkbox, or you could change the three load game buttons to a list of saved games that the player can select from. Thanks for reading and I hope it's been easy to follow and informative. Good luck with your projects!